Cyndan Algae Died B is a non-chlorine liquid treatment formulated to completely kill algae, mildew and also bacteria. Suitable for use in airconditioning cooling towers, swimming pools, fountains, ponds, golf courses, bowling greens, sports fields and anywhere algae, mildew and bacteria need eradicating. Algae Died B is compatible with chlorine. 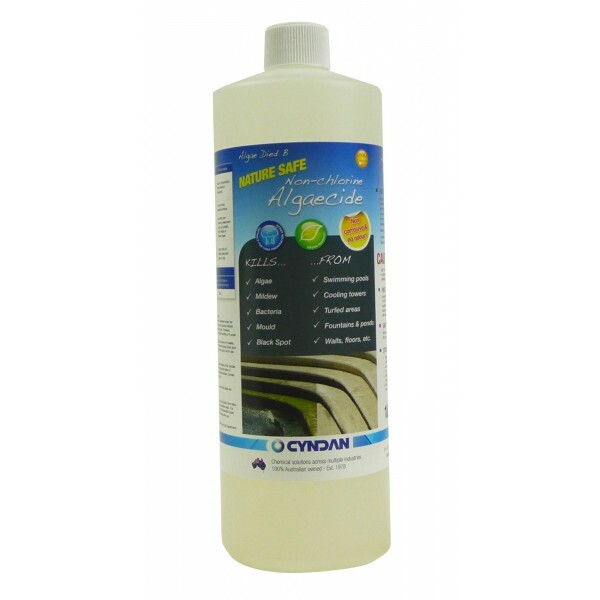 It is a nature safe, non-corrosive, odour free, super concentrate that may be diluted with up to 80,000 parts of water. Extremely effective for use on all surfaces such as slipways, concrete paths, painted surfaces, natural & artificial grasses, and many other areas. Algae Died B is an approved A.Q.I.S. category 6 sanitizer which is suitable for footbaths & equipment. Algae Died B is also registered and approved with the A.P.V.M.A. Australian Pesticides & Veterinary Medicines Authority. Streak Free is a machine dishwashing powder with built-in rinse additive, is an oxygen activated detergent powder containing sanitising and anti-bacterial properties for commercial and domestic-style dishwashers. Available in 10kg Bucket or 10kg Bag.